Color: random color. Due to the light and angle, there might be slight difference on color. High quality tissue paper with a wore frame for you to assemble it easily. Perfect for decorating baby shower, wedding ceremony, birthday party, bridal shower, ect to create a happy atmosphere for you. Our lantern can be folded easily and store in your case, reuseable, saving your space and money. PREMIUM MATERIAL:Our delicate lanterns are made of high quality tissue paper with a wore frame for you to assemble it easily. 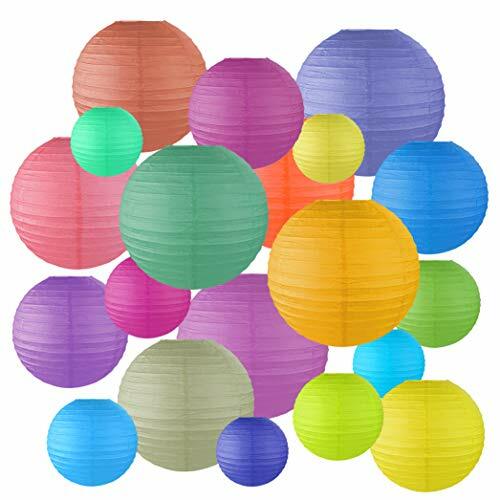 PACKAGE CONTAINS:20 colorful paper lanterns in 5 sizes(4in,6in,8in,10in, 12in) which meet your different require. They are enough for your daily use.Although we have various colors of lantern, they are sent randomly.Due to the light and angle, there might be slight difference on color. NICE DECOR: The colorful lantern is perfect for decorating baby shower, wedding ceremony, birthday party, bridal shower, ect to create a happy atmosphere for you. REUSEABLE&PROTABLE: Our lantern can be folded easily and store in your case, saving your space and money. HOW TO USE:The lanterns are very easy to hang with the metal support, which makes your room elegant.